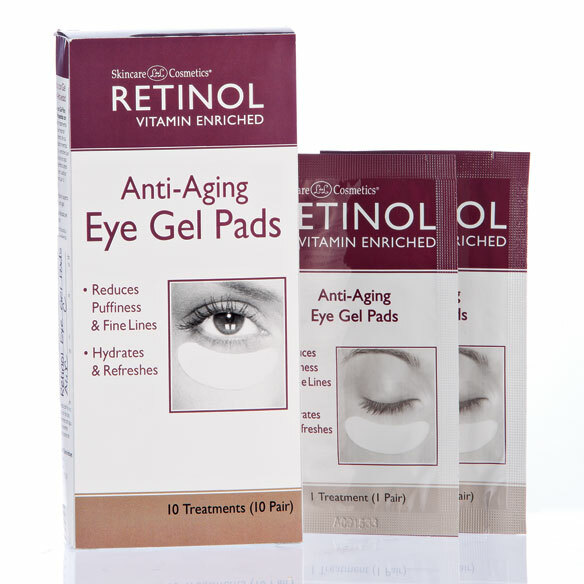 Retinol anti-aging eye gel pads revive and refresh for a bright, youthful appearance. Under eye pads enriched with skin-loving retinol palmitate improve skin’s texture and minimize the look of fine lines and wrinkles. Super hydrators — including phyto collagen, vitamin E, glycerin, aloe vera and allantoin — refresh the delicate skin around the eye area, leaving it firmer, brighter and more radiant. Simply apply pads to freshly cleansed under-eye area and wear for 15–30 minutes. Soothing retinol eye gel improves skin in minutes. Natural ingredients smooth and hydrate. Use 2–3 times per week for best results. 1) Wash face with Retinol Anti-Aging Cleanser. 2) Remove pads from plastic liner. Apply under each eye with shiny side facing skin. 3) Wear for 15-30 minutes. 4) Remove slowly by lifting up from edges. Rinse off residue with water. I have regularly used the Retinol eye gel but this is my first time trying this. If it works half as well as the other Retinol products I have purchased, I'll be more than satisfied. Love these eye pads they work just like they say. Tried these previously and liked them very much.